[134 Pages Report] The log management market size is expected to grow from USD 707 Million in 2017 to USD 1,248.9 Million by 2022, at a Compound Annual Growth Rate (CAGR) of 12.1%. The base year considered for the study is 2016 and the market size is calculated from 2017 to 2022. The objective of the report is to define, describe, and forecast the log management market on the basis of components (solution and services), deployment modes, organization sizes, verticals, and regions. The report analyzes the opportunities in the market for stakeholders by identifying high-growth segments in the market. 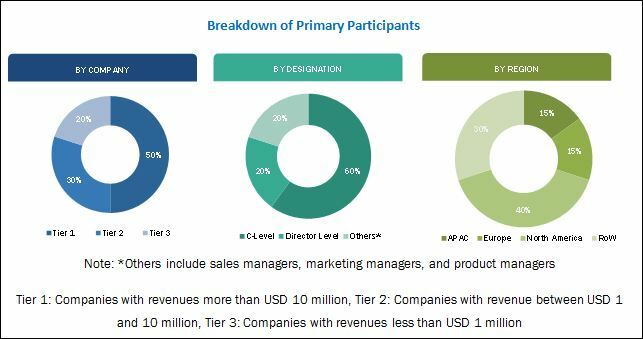 Furthermore, the report profiles the key players in the market and comprehensively analyzes their core competencies, such as new product launches, acquisitions, partnerships, agreements, and collaborations. Moreover, the report also covers detailed information regarding the major factors influencing the growth of the market (drivers, restraints, opportunities, and challenges). The log management ecosystem comprises major vendors such as IBM Corporation (New York, US), Intel Security (California, US), SolarWinds Worldwide, LLC (Texas, US), Splunk Inc. (California, US), LogRhythm, Inc. (Colorado, US), Alert Logic (Texas, US), Loggly, Inc. (California, US), AlienVault (California, US), Veriato, Inc. (California, US), and Blackstratus, Inc. (Palm Beach, US). Other stakeholders include log management service providers, consulting firms, Information Technology (IT) service providers, Value-Added Resellers (VARs), enterprise users, and security and access management technology providers. Detailed analysis and profiling of log management vendors along with the vendor DIVE matrix to get detailed information regarding competitors based on product offerings and business strategies. The report reviews the major players who offer log management services. Additionally, the report outlines the findings and analysis on how well each log management vendor performs within MarketsandMarkets criteria. The log management market size is expected to grow from USD 707 Million in 2017 to USD 1,248.9 Million by 2022, at a Compound Annual Growth Rate (CAGR) of 12.1%. The major growth drivers of the market include increasing Advanced Persistent Threats (APTs), strong regulation and compliance requirements, and increasing network complexities, and growth in the number of network devices. The log management market is segmented by component (solution and services), deployment mode, organization size, vertical, and region. The solution segment in the market is expected to have the largest market size during the forecast period. The reason behind the high growth rate is the increased need to secure IT infrastructures from advanced cyber-attacks, such as, zero day attacks, ransomwares, and malwares. The managed services segment is expected to grow at the highest CAGR during the forecast period. However, the professional services segment accounts for the largest share of the market in 2017. The cloud deployment mode is expected to grow at the highest CAGR during the forecast period. The large enterprises segment is expected to account for the largest market size in 2017. Moreover, the Small and Medium Enterprises (SMEs) segment is expected to grow at the highest CAGR during the forecast period. Log management services have been deployed across various industry verticals, including Banking Financial Services, and Insurance (BFSI), energy and utilities, government and public utilities, healthcare, Information Technology (IT) and telecom, retail, and others. The government and public utilities vertical is expected to grow at the highest CAGR during the forecast period. However, the BFSI vertical is estimated to have the largest market size in 2017. 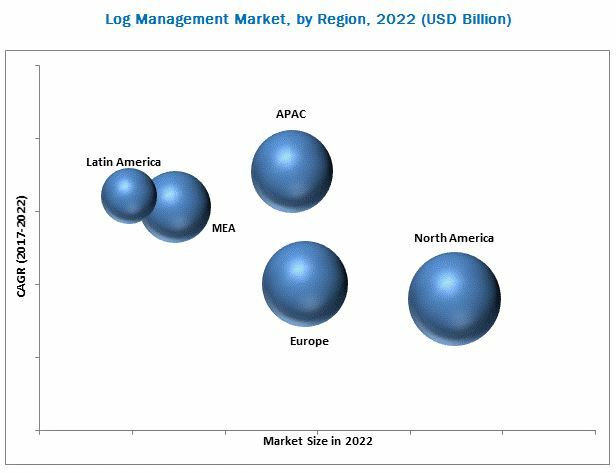 The global log management market has been segmented on the basis of regions into North America, Europe, Asia Pacific (APAC), Middle East and Africa (MEA), and Latin America to provide a region-specific analysis in the report. The North American region, followed by Europe, is expected to become the largest revenue-generating region for log management services in 2017. This is mainly because the organizations in the developed economies of the US and Canada are highly focused on innovations obtained from Research and Development (R&D) and security technologies. The APAC region is expected to be the fastest-growing region in the market. The growth in this region is primarily driven by the increasing adoption of IoT devices and BYOD technologies within organizations. However, easy availability of free and open source log management solutions may restrict the log management market’s growth. Major vendors that offer log management solutions and services across the globe are IBM Corporation (New York, US), Intel Security (California, US), SolarWinds Worldwide, LLC (Texas, US), Splunk Inc. (California, US), LogRhythm, Inc. (Colorado, US), Alert Logic (Texas, US), Loggly, Inc. (California, US), AlienVault (California, US), Veriato, Inc. (California, US), and Blackstratus, Inc. (Palm Beach, US). These vendors have adopted different types of organic and inorganic growth strategies, such as new product launches, partnerships and collaborations, and acquisitions, to expand their offerings in the market. *Details on Business Overview, Products & Services, Key Insights, Recent Developments, Might Not Be Captured in Case of Unlisted Companies.